Install Smart Scroll Posts and give your readers a super comfort while reading! Load your infinite WordPress posts on scroll! Give the great user experience to your blog/website visitors. Easy to read articles/blogs without clicking article titles/next/previous etc. Option to apply smart scrolling to all categories or specific categories. Option to choose the default loader or upload your own. Simple to use – just add a CSS CLASS to your code. 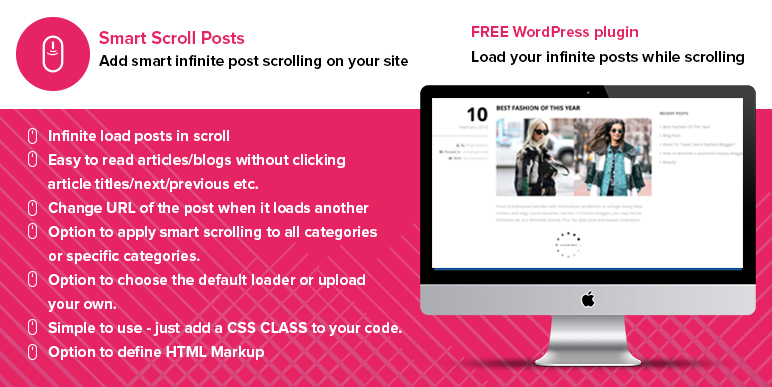 Hey Buddy!, I found this information for you: "Free WordPress Infinite Post Loader (Scroller) Plugin – Smart Scroll Posts". Here is the website link: https://access-keys.com/wordpress-plugins/smart-scroll-posts/. Thank you.